Born in Germany, John A. Sauters immigrated to Galveston in 1840. Although he trained to become a clergyman, in Galveston he had other pursuits, operating a fancy goods grocery business and the Gothic Saloon. While Sauters imported wholesale treats, his wife, Magdelenia, helped manage the bar. In addition to selling choice liquors, ales and mint juleps, she kept an oyster parlor in the cooler months and sold ice cream, lemonade and other “luxurious” iced drinks in the summer. The saloon served as a de facto meeting place in town where the Howard Association was founded in 1845 and where the Galveston Debate Group argued the question, “Ought the Texian Government to have put Santa Anna to death in 1836?” The saloon also served as the stage for Galveston’s first theatrical performance. A troup of amateaurs performed “The Man Down Town” and “The Miser of Marseilles.” Despite its popularity, by December of 1845, Sauters recognized that the city was changing. 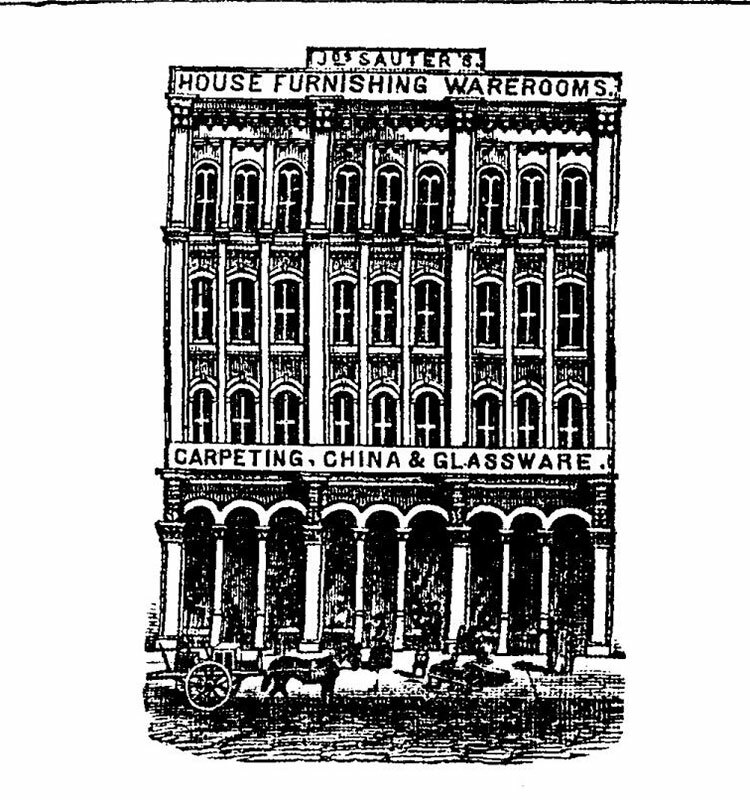 He sold off the saloon’s fixtures to open a new store, the very successful, House Furnishings Warehouse. Emigrant guidebooks list Sauter’s store as one of the most attractive features of Galveston. Incoming settlers could purchase anything they’d need for their new life in Texas, provided they had enough cash on hand. “A family can arrive at Galveston at nine o’clock in the morning, engage a house and… they can be snugly settled ‘at home’ before the going down of the sun.” Sauters sold items as large as carpets, furniture and pianos and as small as silverware, washboards, and glasses. He traveled throughout Europe picking and shipping inventory for his store. In 1861, he expanded to a new, four story building on the north east corner of 23rd and Market Streets. After the Civil War, he returned to Germany, leaving the business to his brother, Joseph, who operated the store until his death in the 1870s. John briefly returned from Germany to auction off the business holdings. He died in 1874 at his estate in Stuttgart, Germany. He was known for his untiring business acumen and his daily walks around the city.